This article submitted by Stephanie Everson on 07/08/97. 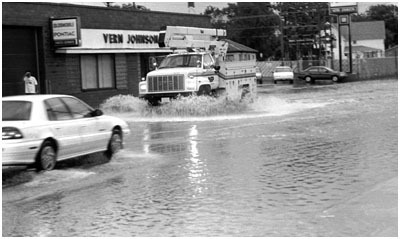 Heavy rains on Tuesday, July 1, left Paynesville streets flooded. More than 2 inches of rain fell in a half an hour period. Although the downpours of the past two weeks have seemed to be more than usual during this time of year, according to the Stearns County Weather Service, it is not abnormal. The recent thunderstorms that have done some property and crop damage in the area are part of an active weather pattern and likely won't let up for the next four to eight days. Even so, the seemingly large amount of rain is not unusual. The reason it's more noticeable is because the past couple summers have been dry. According to the weather service, we're now seeing the rain finally pushing its way through. Although estimates in the Paynesville area are 8 to 10 inches of rainfall in the past two weeks, as of July 6, the St. Cloud area saw a total of only 2.9 inches of rainfall. Although the storm of July 1 came close at 1.25 inches in St. Cloud, it did not beat the 1962 record of 1.28 inches. According to Dan Martin in the Benton County Extension Office, no substantial crop damage has been reported in Stearns County so far. With rain throughout the rest of the summer, farmers can be hopeful for a good 1997 crop.